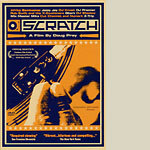 Scratch is the definitive film that explores the world of the hip-hop DJ. From the birth of hip-hop, when pioneering DJs began extending breaks on their party records, to the invention of scratching and ''beat-juggling'' vinyl, to its recent explosion as a musical movement called ''turntablism,'' it's a story of unknown underdogs and serious virtuosos who are radically changing the way we hear, play and create music. Directed and Edited by Doug Pray. Produced by Brad Blondheim and Ernest Meza.